Перевод статьи на русский язык читайте здесь! 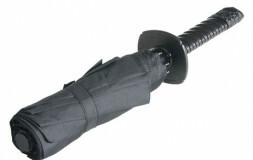 For those who like it rough! The action is fast and the body contact can be bone jarring. But that’s way the followers of one rough and tumble version of the arts like it. They enjoy the hard give and take of body to body contact. These are practitioners of Nippon kempo, a young but lively martial art. 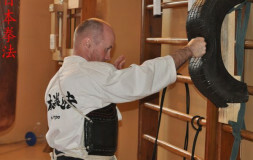 Kempo employs a variety of techniques. 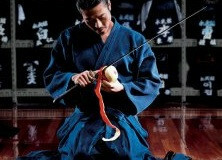 It is really an amalgam of several arts – judo, karate, aikido, etc. 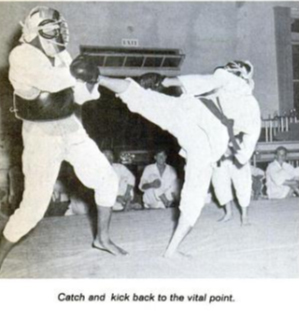 The forms in kempo revolve around four basic moves: kicking, striking, throwing, and reverse holds. 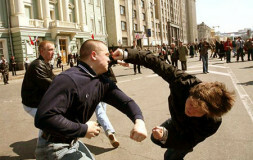 A favorite move is the spin kick to the face. 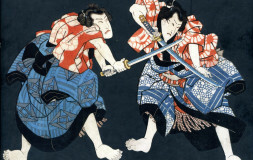 As might be expected, Nippon kempo is not one of the arts specializing in a soft style. 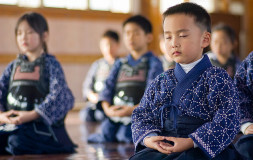 The founder of Nippon kempo in the United States, Goki Kinuya, underscores the hard approach. “Power. 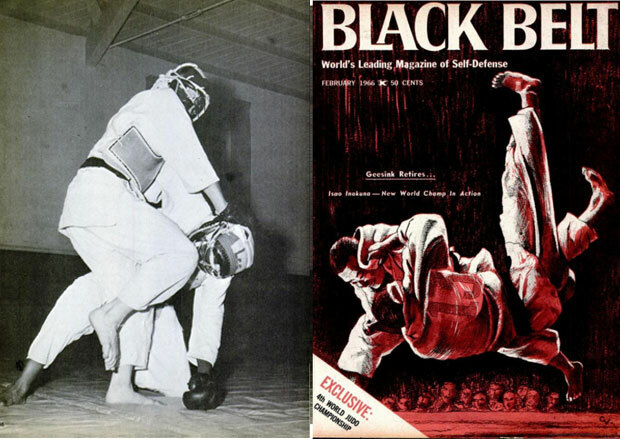 Speed and power are what I try to impress upon my students,” Kinuya told Black Belt during an interview. 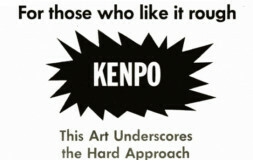 The followers of kempo tend to be a different breed. 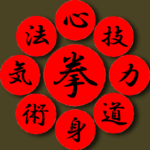 Many of them previously studied other martial arts. They switched because they’d rather fight. These enthusiasts will tell you that with some of the other arts they felt too restrained, or frustrated really, in having to hold back on their blows. According to them, they gain a greater sense of satisfaction and a richer understanding of the methods of their art when they can follow through and make personal contact. This wild and woolly art is strictly a mans game. Because of the emphasis on contact and power, the ladies usually pass this one up. 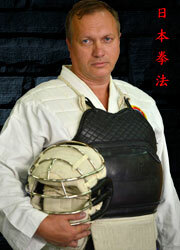 However, they can take up kempo but would be restricted to studying the forms. Before sguaring off a practice session, the opponents put on plenty of protective eguipment. 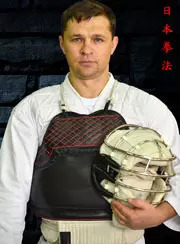 When fully garbed, a kempo student looks something like a baseball catcher who accidentally wandered into a dojo. 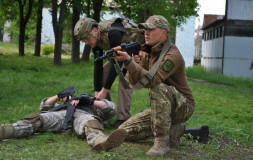 The opponents wear gloves, chest protectors, face masks, and special heavy padding in the groin area. The items are manufactured in Japan and a complete outfit runs about $59. 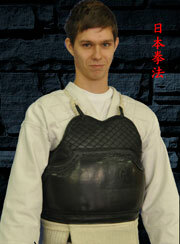 Beginning kempo students are never allowed to suit up for a session or to make contact. 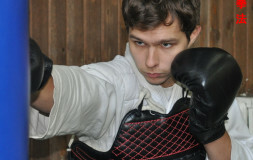 They put in an intensive period studying and practicing forms before being allowed to don fighting gear. 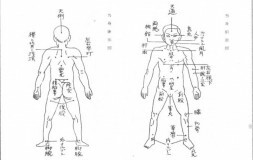 During this period they also learn about the vital points of the body. Since many points are not covered by the protective eguipment, the student must learn to avoid these areas or to hold up blows aimed at these points. Otherwise, it’s a free swinging art. 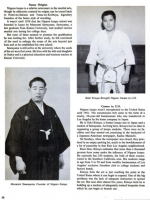 Goki Kenuya, Brought Nippon Kempo to U.S.
Nippon kempo is a relative newcomer to the martial arts, though its adherents contend its origins can be traced back to Nomi-no-Sukune and Toma-no-Kerihaya, legendary founders of the Sumo style of wrestling.
. Sawayama, a law graduate from Kansai University, had studied various marital arts during his college days.
. After further study, he felt convinced of the need to enlarge the scope of the arts beyond just kata and so he established his own school. Sawayama is still active at the university where the seeds of his are were first sown. He lives with his wife and daughter in Osaka and is a physical education and business teacher at Kansai University. 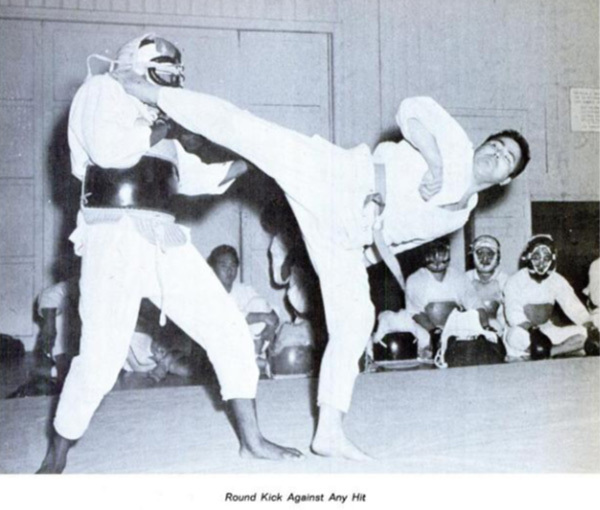 Nippon kempo wasn’t transplanted to the United States until 1961. The transmission belt came in the form of a stocky, 26-year-old businessman who was transferred to Los Angeles by his home company in Japan. 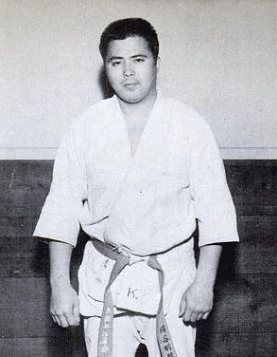 He is Goki Kinuya, a former kempo start in Japan and a student of Sawayama. Arriving here, Kinuya lost no time in organizing a group of kempo students. There were no facilities and they started out practicing in the backyard of a Japanese-American newspaper, Kashu Mainichi. On Sundays, when the newspaper was closed, they practiced in an empty parking lot, much to the bewilderment of a lot of passersby in that East Los Angeles neighborhood. 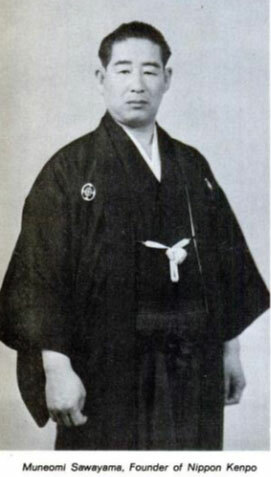 Since then, Kinuya estimates that more than a thousand persons have come under the influence of Nippon kempo. He currently has 250 students, the bulk of them concentrated in the Southern California area. His students range in age from 5 to 50 and from wealthy businessmen of Los Angeles exclusive Jonathan club to college students and factory hands. Kinuya feels the art is just reaching the point in the United States where it can begin to expand. One of the big problems was the lack of adequate instructors to spread the art. But now after almost five years, Kinuya feels he is building up a nucleus of adeguately trained kempoists from which he can begin to branch out. There are other ambitious plans afoot. 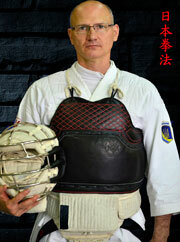 Kinuya’s American Nippon Kempo Federation hopes with two years to challenge the mother country of the art to a match. 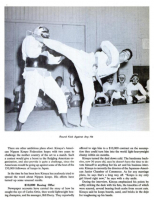 Such a contest would give a boost to the fledgling American organization, and also provide it guite a challenge, since the Americans would be going up against some of the best of the 150,000 followers of kempo in Japan. 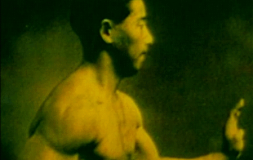 In the time he has been here Kinuya has zealously tried to spread the word about Nippon kempo. His efforts have turned up some unusual results.
. They reportedly offered to sign him to a $10,000 contract on the assumption they could turn him into the world light – heavyweight champ within six months. Kinuya turned the deal down cold. The handsome bachelor, now 30 years old, says he doesn’t have the time to devote himself to anything but his art and his business interests. Kinuya is curreently the director of the Japanese-American Junior Chamber of Commerce. As for any marriage plans, he says that’s a long way off. “Kempo is my only girl friend right now”, he says with a shy smile. 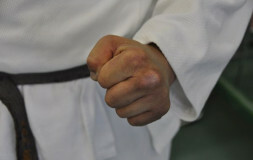 During the interview, Kinuya emphasized his points by softly striking the desk with his fists, the knuckles of which were scarred, several bearing fresh scabs from recent cuts. 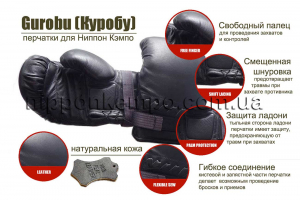 Kinuya said he keeps boards, sand, and bricks in the dojo for toughening up his hands. 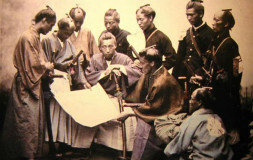 He explained that Nippon kempo is not characterized, like some other arts, by a riding and formal style. Great stress is laid instead on freedom of style and individual approach.
. But form is discouraged in actual contests. 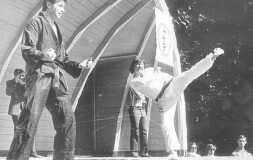 Students are encouraged to make full use of the various methods of kempo and to improvise and change their tactics when engaged in fact to face contest. “If you follow form, them your opponent might be able to guess your next moves,” Kenuya says. 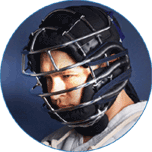 When the protective gear goes on, form goes out the window to be replaced by power, speed, concentration, and agility. 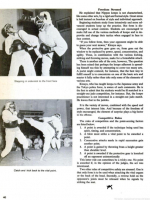 These, in combination with the various kicking, striking and throwing moves, make for a formidable attack.
. A purist might contend, for instanse, that the best way to fulfill oneself is to concentrate on one of the basic arts and master if fully rather than take only some of the elements of various arts. 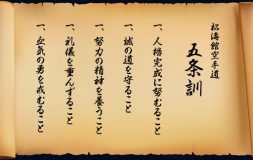 Kinuya, who has taught kempo to the Japanese army and the Tokyo police force, is aware of such comments. 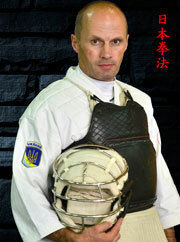 He is the first to admit that his students wouid be ill matched in a straight-out judo competition, for instance. 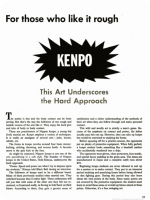 But, the kempo practitioner is not interested in a straight – out judo match. He leaves that to the judoka. 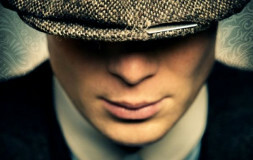 It is the variety of moves, combined with the speed and power, that interest him. And because of the freedom of style encouraged, the element of surprise plays a big factor in his offense. 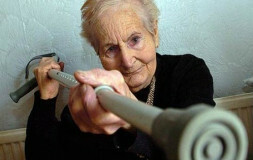 A point it awarded if the technigue being used has spirit, timing, and concentration. 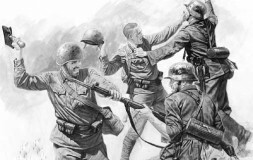 A blow must strike a vital point to be awarded a point. Consecutive attacks made in rapid successin gain another point. A point is gained by throwing from a height greater than shoulder level. 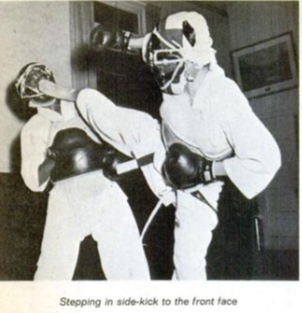 A point is awarded if the protective gear is knocked off an opponent unintentionally. This latter rule can sometimes be a tricky one. No point is awarded if, in the opinion of the judges, the act was intentional. Two other rules of competitive safety are stressed. 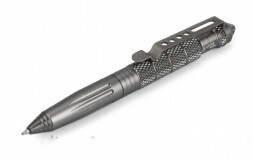 One is that only form is to be used when attacking the vital organs or the back of the head. 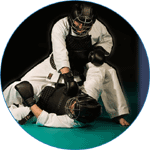 Secondly, a reverse hold on the opponent’s joints must be released when he signals by striking the mat.